The republic of Tyva is one of the least known and most curious corners of Russia. The Tyvans are nomadic pastoralists by nature Buddhist and shamanist by religion, Mongolian by cultural heritage, and Turkic by language. Locals say that Tyva is located in the very center of Asia. The geometrical center of the Asian continent defined by scientists lies in Kyzyl – capital of Tyva - and is marked by the stone monument. Tyva is an area of great variety, with almost every type of landscape: luxuriant meadows, boundless steppe, medicinal springs, beautiful lakes, rushing mountain rivers fed in spring by melting snows, dusty semi-deserts and snowy chains of mountains. The high peaks and alpine lakes of the Sayan Mountains in south-west of Tyva give rise to the tributaries that merge to become the mighty Yenisei, one of Siberia's major rivers flowing over 2000 miles to the Arctic Ocean. 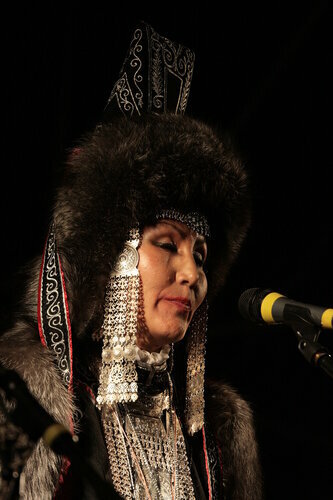 This magic land is famous for its unique nature reserves, traditional festivals and customs (wrestling, throat-singing, etc.) and a mixture of Buddhist and shamanist beliefs of its people. The Tyvans form about two-thirds of the republic’s 300,000 population (most of the rest are Russians). Despite the development of modern technologies and market economy in Russia, most of the Tyvan population is still semi-nomadic, moving their herds out from their villages to summer pastures where they live in yurts. The range of animals that they herd reflects Tyva’s crossroads character- camels, yaks, cows, horses, goats, sheep, and even reindeer in the eastern forests. Tyvan music and singing has become well known around the world for its unique tunes and sounds. It is indeed the Tyvan pastoralists' keen perception of natural landscapes that has most shaped their music. The Tyvans preserve what are arguably some of the world's oldest forms of music making. The best-known genre of Tyvan music is throat-singing – a spine –tingling, deep-down, tuneful chanting. Traditionla costume of the Tyvans consists of a robe (or jacket) called hurim and Tyvan hats worn by both men and women. These traditional hats are beautifully made. Cotton lined with pointy tip, is topped with a satin knot and is trimmed with satin piping (which is also on the four velvet flaps which surround the hat). The traditional dwelling of the Tyvans in the west and the south is a felt yurt of the Mongolian type. Tyvans also cover their yurts with deerskins. The traditional food of the Tyvans is dairy products, meat dishes and araka, an alcoholic drink made from sour milk. The main Tyvan festivals are Shaaga, the Buddhist New Year, which corresponds to the lunar new year, and Naadym, in July, which is an occasion for long-distance horse-racing, traditional Tyvan wrestling and throat-singing. Tyvan festivals is q unique spectacle full of singing, dancing and folk traditions. Tyva Buddhism is the religion of Buddhism that depends on Tibet Lamaism and accepts Dalai Lama-Dalai Lama14. Shamanism is not accepted as the official religion of Tyva but this religious belief is still preserved and maintained among the Tyvans. Shamanism goes back to animism, a belief in the presence of spirits or spiritual qualities in objects of the natural world. People contact spirits for guidance through a medium or shaman, mainly female in Tyva. The eastern part of the republic of Tyva is mainly forested, with more rivers and lakes than elsewhere in Tyva. One of the draws of the region is Toora-Khem and Lake Azas. Lake Azas is big and beautiful, surrounded by forest and mountains. The only way to come here is by boat from Kyzyl up the Bolshoi Yenisey to Toora-Khem, about 30km west of the lake. While and unforgettable river trip to the lake is one of the best experiences as you’ll be able to see some of the most enigmatic and beautiful pristine parts of the world. Samagaltay is the first capital of Tyva, as well as one of its oldest localities founded already in 1773. 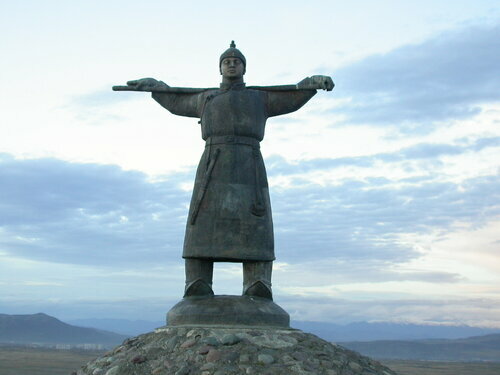 In the pre-revolutionary time Samagaltai was an important trading center with China and Mongolia. The village Samagaltay, 165km south of Kyzyl, has a beautiful Buddhist temple. Locals here carve and sell small Buddha figures made from agalmatolite. Erzin, 220km from Kyzyl, is a town of almost entirely Tyvan people. South of the town is a land of deserts that have camel herds. War lyric song -"Good-bye, boys"